I’m forever looking for fun and easy kid’s snacks. Lately, I’ve been in love with the Kraft Foods site. They have loads of easy snacks and full meals. They’re all categorized and easy to search. I wasn’t even paid to say that! I just really like it! So… today… I ran across a crackers, fruit, and cream cheese snack. All three of these ingredients are things we love. 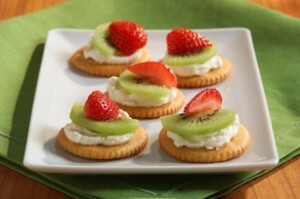 Spread some delicious cream cheese on your cracker and then top with fruit! It’s as easy as that! Enjoy! Ooooh that looks like an easy peasy fun snack! Holy cow… I would eat those. Seriously yum.